Scent attractants are quickly becoming some of the most popular and successful methods for bringing in big boars. The one down-side to using scent is that it is very susceptible to the elements such as rain and sun. The liquid scent can easily be evaporated or washed away before it has time to do its job correctly. With the aid of an easy-to-build scent dispenser, your wild boar attractant can be kept protected and only “dispensed” when the hogs are actively messing with the canister. Here’s how to make one and how it works. Go down to your local hardware store and buy the following: 1 foot piece of 4” schedule 40 PVC pipe, 1 cleanout cap with screw in top, 1 eye bolt with 2 nuts and 2 washers, cable or heavy rope, and PVC glue. You will need a drill, 1/8” drill bit, a wire brush, and some other basic tools depending on how you choose to finish your dispenser. 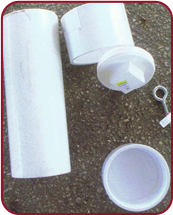 First, clean the edges around each end of the PVC pipe and glue the solid cap to one end. Next, flip the pipe over and glue the clean-out to the other end of the pipe. Once this is done, set this to the side and allow it to dry. Take the cap from the clean-out and find a drill bit just larger that the diameter of the eye bolt that you have. Drill a hole directly in the center of the cap so the eye bolt can be inserted and bolted down snug. set. Now all that is left to do is drill your holes. rill bit that I use for the eye bolt hole). If you measure exactly 5” down from the top of the dispenser, it will hold 2 quarts of scent attractant before it begins to come out of the holes. I rough up the PVC beneath the holes with a wire brush so the scratches will hold the scent. An angle grinder with a wire wheel attachment works best. Wild Boar Matrix or Acorn Scent. To stretch these scents into two quart quantities, you can mix both Matrix and Acorn Scent with a light mineral oil (I was told this by the owner of “In Heat Scents”). You can also put a few cups of corn in the pipe, pour in some water, let it sit and ferment, creating your own soured corn scent. ispenser of scent is a long process which, in no way, will be effected by the rain or blazing sun. A large group of hogs will not be able to devastate a scent station in one night and then move on. It will take days to empty the dispenser – you should be able to take care of business and get a few of them into your cooler! a great project to do with your kids. Put a couple out and see the difference it makes in how long your scent lasts. This article was originally published in the Jan/Feb 2007 Wild Boar USA Magazine, Vol. 1, Issue 2. For a complete collection of the printed articles, please visit our storefront.